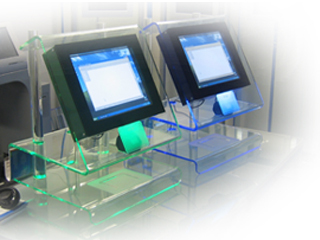 This attractive Desktop Kiosk, compact in design includes a fully integrated panel PC. Although unusually shaped this Kiosk is constructed using an industrial 1.6 GHz Atom PC components, making maintenance very easy. The Mini ITX motherboard offers USB, Serial, Parallel and PS2 Keyboard and Mouse I/O ports. The lower peripheral cover is lockable to prevent unauthorised access. Its most important feature is that it's a portable self-contained designed for the desktop operation. - Dimensions: 500x610x430 mm (WxHxD). Weight: 16kg.